Corvette BBQs Combine A Love Of Speed And Steak | OhGizmo! A few weeks ago I wrote about a couch that was modeled after the back-end of an Aston Martin DB6. Unfortunately the price was a bit on the high side ($7,300) and that didn’t even include the shipping costs from the UK where they’re built. So here’s a ‘made in America’ alternative that combines the back-end of a Corvette with a large BBQ. Like with the DB6 couch, no actual Corvettes were harmed in the making of these grills, but the 2000 degree fiberglass resin reproductions look exactly like the real thing. The firebox itself is insulated to prevent damaging the paint job and other accessories while the grill is hot, and it comes in either a propane or charcoal version depending if you want to taste the heat or the meat. As an added effect the taillights even work but you’ll need someplace to plug in the retractable 20 foot power cord. The grill even comes with a UV protected black cover embroidered with the customer’s name and the date of manufacturing. 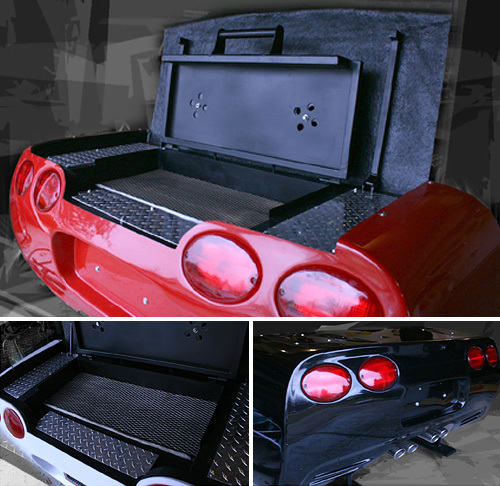 The charcoal version of the BBQ Vette runs $1,795 while the propane version is $2,195. They come in 4 standard colors including yellow, black, white and red but custom VIN color matching is also available. How can you talk about environment and ecology for some “green” gadgets and then post… this?